This past weekend my wife took the kids and went to the Farmer’s Markets in Omaha, Nebraska. The food is incredible and what I could not believe was the price. The prices were literally less than grocery store prices.We hear a lot of talk about eating local and growing your own food. I think more people need to think about farmers markets and Agri-Business coming together to feed ourselves and the world. We need both. It’s not a one or the other objective. Instead of eating junk food, why not take the family and visit a local farmers market. These places are a great alternative to the countless food junk items that we as a country continue to eat. COWEN: I think agribusiness and consumerism are seen as the great villains. I think both are essential; we can’t do without them. They feed the seven billion people in the world. We do need to improve them, but I would work on them through innovation. The biggest food problem in the world today is that agricultural productivity is slowing down and for a lot of the world food prices are going up. And for that we need more business, technology and innovation, not locavorism. We need to value our farmers more. This could not be more true. Farmers are looked at today as the rich people who are making money off of the land because of the higher food prices in the store and higher commodity prices. This type of thinking needs to be minimized. Farmers are a great asset to our food chain and they are producing more with less resources. It’s a great story that needs to be told. WATERS: I think that the work of the farmer needs to be elevated to a very important and vital place, and we need to consider the people that take that on as precious as the people who educate us in schools. And when that happens, when we begin to value our farmers, you’d be surprised how many people will answer that call, who will really be encouraged to take on that profession. It’s happening already, just among young people who are concerned about the future of this planet, and know that we’re headed to a dead end if we don’t think about where our food comes from and take care of that land that produces our food. People need to embrace food grown locally and globally! Children need to understand where our food comes from and what types of food are healthy and not healthy. 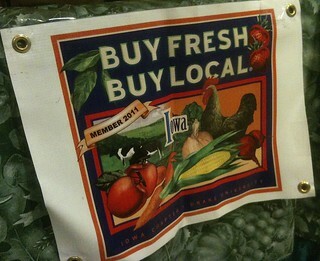 Check out a local farmers market like the one mentioned in the video below and remember where your food comes from.